﻿ Close the camps > English – “Voluntary” returns: another way to deport ? “Voluntary” returns: another way to deport ? "Voluntary" returns: another way to deport ? EU Member States increasingly resort to “voluntary” return procedures to send migrants back to their countries of origin. This solution, not only cheaper and sometimes quicker, also appears in the public eye as more humane than forced returns. However, it remains a means of expulsion. In France, for many years, “voluntary” returns were included in figures on forced returns. 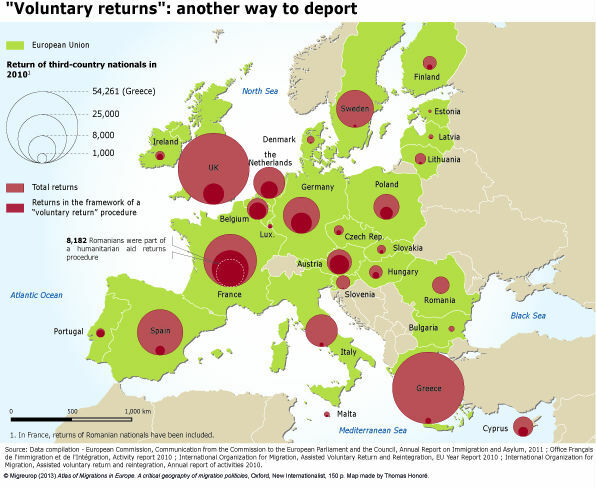 In 2010, in Austria, Belgium, France, Ireland and Portugal, “voluntary” returns made up more than half of the total number of removals of migrants in an “irregular” situation.